This solution helps designers to draw, document and list the necessary reinforcement for their buildings in ArchiCAD. 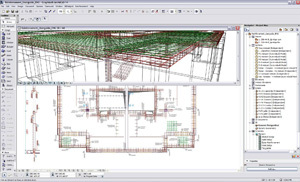 The application provides tools to define all 2D drawings and the complete 3D model as well. This price is only available for ArchiCAD 16 Teamwork and ArchiCAD 16 Solo customers with a current archiEDU service agreement. [eptar] developed a powerfull Add-on to design rebar structures directly in ArchiCAD. The solution helps to define 2D drawings and the 3D model as well. With the help of the editable hotspots rebar, mesh and stirrup shape design are totaly free. User can simply assembly columns, beams and crowns from the basic elements and use them as a complex structure in the BIM model. Placed complex structures are available to edit one by one or all together. Reinforcement Add-on checks the original structure and replace it or create a new one if it is necessary. The solution checks and recalculates the placed rebar numbers, show the cutting list and calculate the full weight of the structure. Label objects help the user to define visible parameters, show rebar number or all the information from the structure. [eptar] tool lets users define the full concrete slab and vertical building element’s rebar structure in a fast and easy way. How to define Civil Enginier view for Ceiling Plan in ArchiCAD? Civil engineers need a simple line contour of the building elements on the main story to show, BUT they also need to see the upper story building structure as well. How to place mesh elements into the ceiling plan. How to create rebar structure in ArchiCAD with [eptar] Reinforcement solution. The solution works in ArchiCAD 13+ and available in 3 languages [English, German, Hungarian]. How to create rebar structure in ArchiCAD with [eptar] Reinforcement solution. The solution works in ArchiCAD 16 and available in 3 languages [English, German, Hungarian].